Few things are better than a day at the beach. A sunny day at the beach or by the pool is one of life’s simple pleasures. It’s the perfect antidote for civilization. Just you and the sounds of the sea or the cooling waters of your pool, unplugged from all your cares. 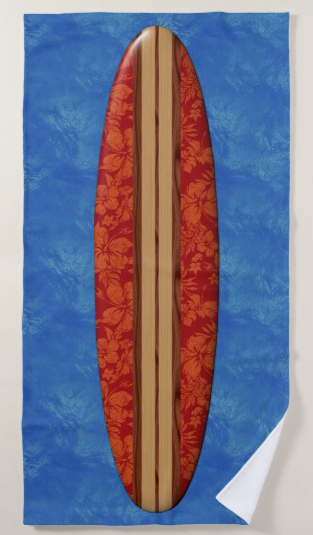 If you’re going to spend your day in the sand or on a lounge, enjoy it in style on our new Hawaiian Beach Towels. Available in over 275 varieties, our new beach towels come in a rainbow of colors and designs. From vibrant florals and Aloha shirt prints, to surfboard designs, Hula girls, Polynesian tapas, and more, our beach towels can transform a day off or trip with the kids to your neighborhood pool into a tropical island escape. Shop styles from retro 50s and 60s classics to edgy contemporary designs. Your little ones can have a blast on comfy beach towels that will inspire their imagination and sense of fun. You can even personalize many of our beach towel designs to make it your own. These large (70" x 35") Hawaiian and tropical sublimation printed beach towels are made from an absorbent polyester and cotton blend face with a pure 100% cotton back. Machine washable. And made to last wash after wash.
Why shouldn’t life be a beach? Give it a little Aloha with one of our Hawaiian Beach Towels.